We moved a lot when I was a little girl, and there’s one house that stands out the most in my memory because it had a ton of unique character and vintage charm. The main bathroom…wait, it was the only bathroom, came equipped with pink and black 1950’s tile. You’ve seen that “retro” look before I’m sure, and maybe even remember it in a previous home as well. The bathroom also had the vintage style medicine cabinet and those long tubular light fixtures on either side-yummy. Even then, at 10 years old, I noticed these details. 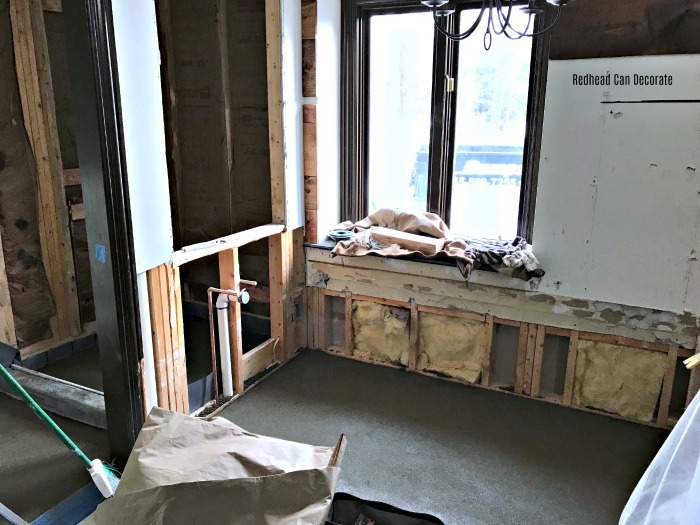 So, while designing our “new” master bathroom I tried to incorporate not only some of the vintage charm that is so dear to my heart, but I also wanted to keep my desire for rustic, and modern style well in tact. I’m pretty sure I’ve achieved that (no I did not use pink tile). 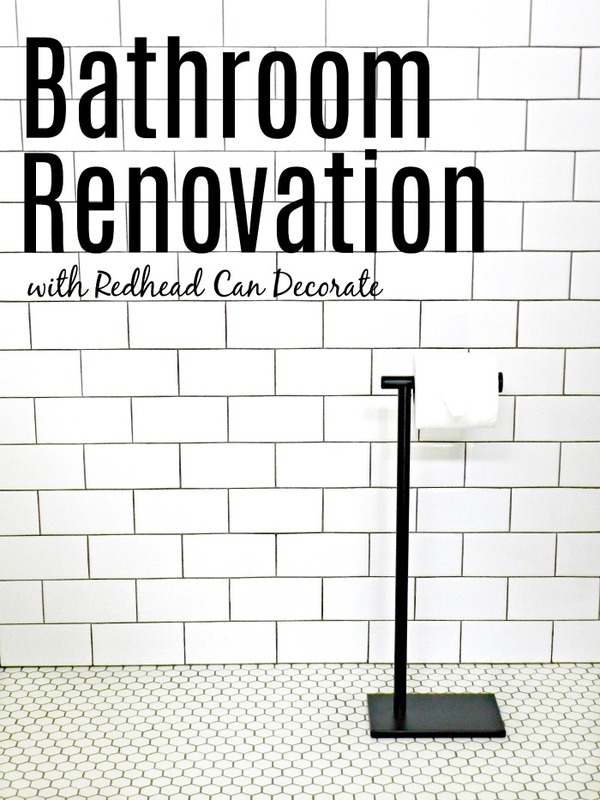 I truly hope our “Bathroom Renovation” inspires you to look back into your past to identify what you truly love. Welcome to part 2 “Master Bathroom Renovation Tile Reveal”. 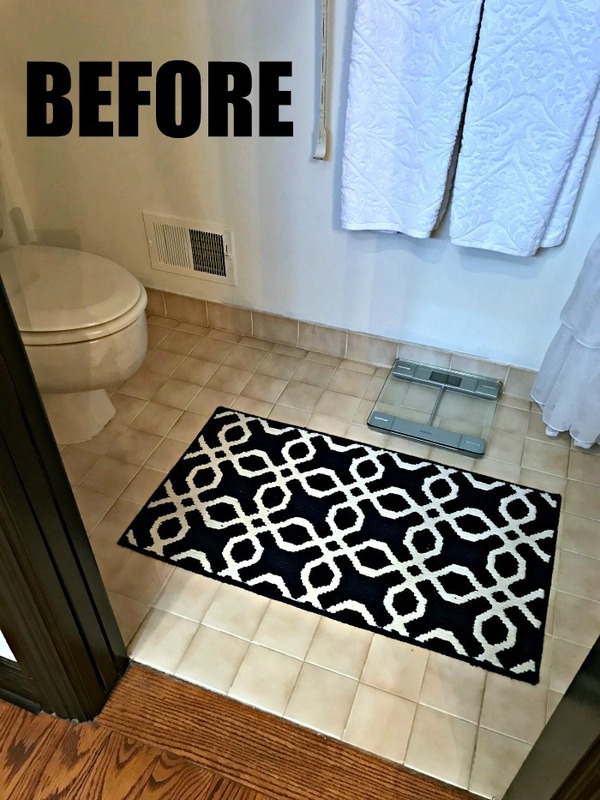 Be sure to check out the full “before” tour here: Master Bathroom Before & Makeover Plans , and stop by soon for the next reveal after this one which should be (I hope!) the new shower & door. View toilet paper holder source below. We are now heading toward the 10 year anniversary of when we moved into this home. 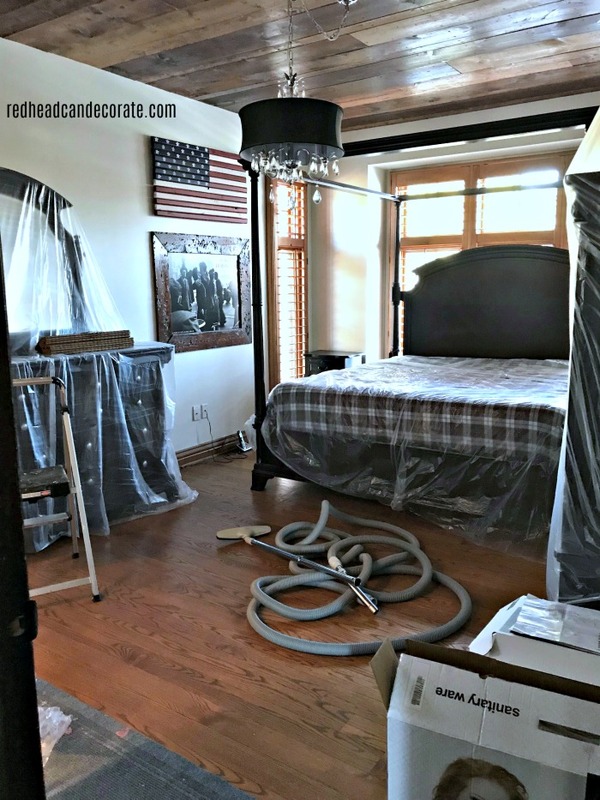 If you follow us here at redheadcandecorate.com you may recall how I’ve really tried to get around the big elephant, I mean tub, in the master bathroom. 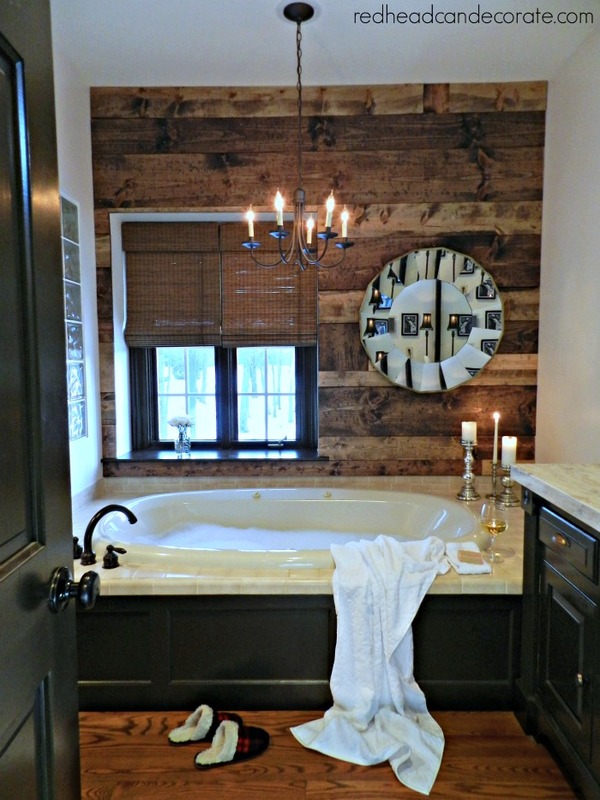 I’ve decorated around it with our “DIY Wood Planked Wall” and heck, I’ve even decorated in it so my husband and I could have a romantic date in the bathroom. Let’s not forget painting the big faucet, too. However, none of that helped the fact that there was only 1 sink 😥 , a dated old tiled shower, and that wasted space of the tub just drove me insane every time I envisioned what I could design there. If you look at the photo below, yes, it looks good. Even beautiful, if I dare. It was even featured in a magazine, here. However, can you guess how I had to open those blinds every day? Yep, I had to hop into the tub to get to them. I’m getting too old for that, man. Then there was the toilet. Oh man, I hated that whiny hardly flushable toilet. It was bad, trust me on that. And the worst part…sharing a sink with my Italian husband. Sorry Rick, but you are messy. So, yes, we were ready. We figured if we are going to stay here for at least another 10 years, we may as well make it exactly what we need and desire. So, that brought us to our decision to finally remove the tub, and the tile (keeping the wood floor and wood wall). We knew it wouldn’t be easy and knew it was way beyond our expertise. To be honest, we don’t have that kind of time either. My husband is a full time lawyer, and I work 30-40 hours per week here on this blog besides taking care of the kiddos. 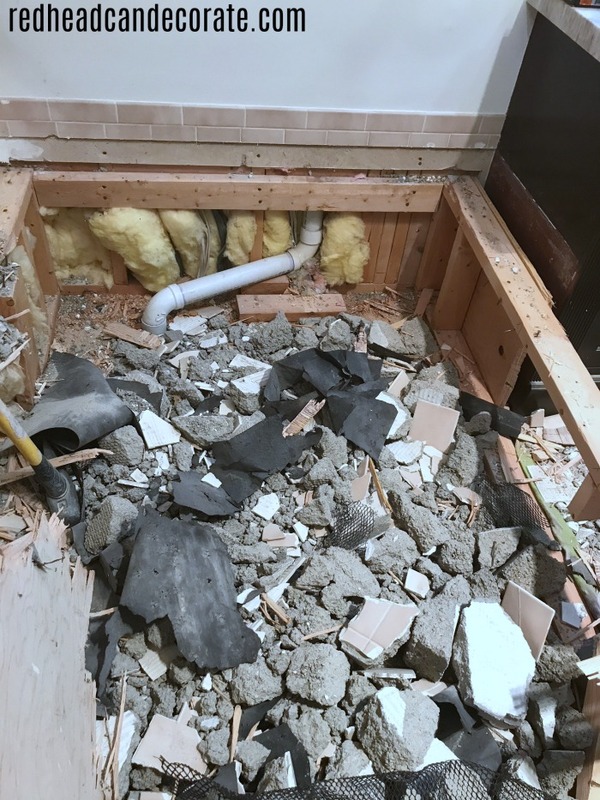 So, we hired out for the tile, but we did remove the tub ourselves. 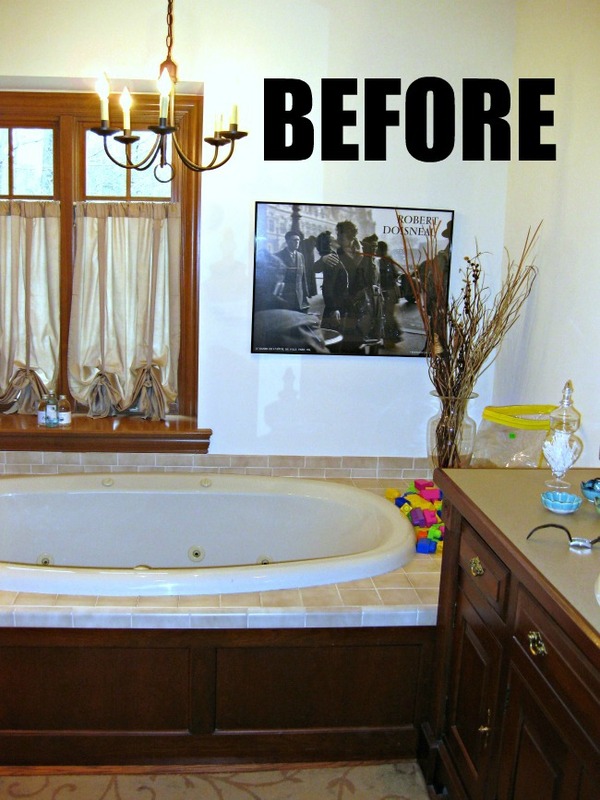 Here’s some advice if you are looking to remove a jacuzzi/Roman tub yourself. Removing the tub is not easy by any means, but something 2 people can do themselves after they research what is involved. Warning: remember there is electricity involved and pipes, so this can be dangerous if not done professionally. So, while we did remove the majority of the tub ourselves, we hired a professional plumber and electrician to unhook the important parts. There are many videos on line that can walk you through the basic removal, but the electrical and plumbing parts are way more involved. If we had to do it over again, I would have hired out all of it because the mess was unbelievable. The other advice I have is to hire a professional to do the tile removal and install. One of the reasons I say this is because you will have enough to take care of with prepping the house for the removal and cleaning up afterward. I’ll elaborate on that further down, but trust me when I say that this is a BIG JOB. If you live in the SE Michigan area I can recommend our tile guy, just leave me a comment below and I’ll get back to you. I think the photo below captures why I feel hiring out is the best option. The tile craftsman had to remove all of that tile. The pretty cement you see on the floor is what levels the floor after they finish the removal. This was at the end of day #2 out of 5 days total for the tile. Here’s a great before shot of the tile they had to remove in the shower. Keep in mind it was also on the floor outside the shower. What I really want you to know is that the mess does not stay confined to just the bathroom. Oh we tried, trust me, but since our bedroom is directly outside the bathroom, we had to remove everything, tape closets and dresser drawers shut, and cover everything in plastic. We also hung drop cloths on each enterance, and the guys taped themselves into the bathroom. This had to stay this way for 5 days, so you will have to find another place to sleep and obviously brush your teeth/shower. It may not seem like it would be that stressful, but when you’re use to running a very tight ship, it definitely causes some anxiety and keeps you very busy. The tile guys had to go in and out constantly for 5 days (with shoes on) so you will need a clear, protected path to the tile cutting station that should be outside or at least in your garage. They should be using a wet saw to eliminate that dust, however your home will still be covered in dust from the tile removal and all of the construction movement. That reminds me, have you read our story about the “Granite Nightmare” we had? It’s a must read because there was over 34k damage to our home. Please read if you are planning on installing granite anywhere in your home: “Granite Nightmare“. 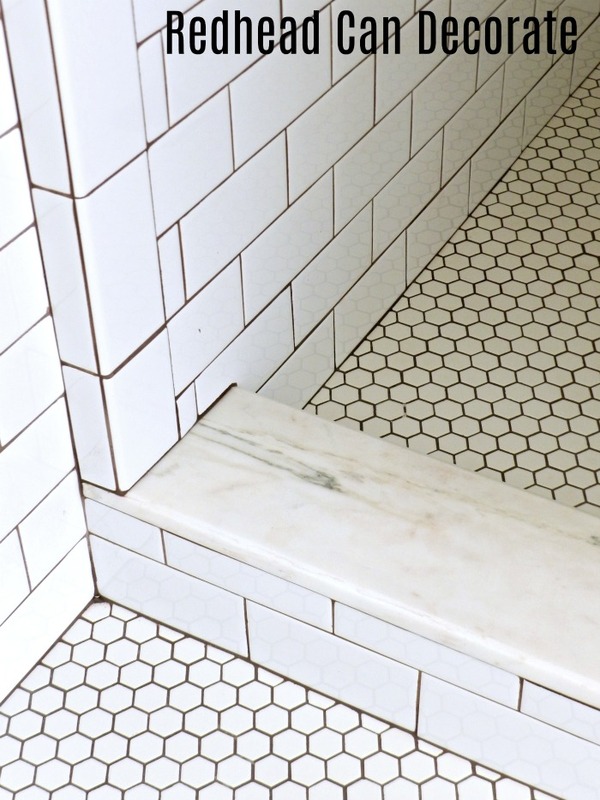 Another fabulous reason to hire out for tile install, is because I have absolutely no experience in doing it. Just look at the gorgeous experienced craftsmanship that went into this tile. Note- the plumbing is set on the left for my husband’s new sink. Also note- that we have BIG DESIGN surprises coming soon on that wall to the right of the window and on the “bench” my husband is building on the far right. The bench actually happened out of necessity when we realized there was a big drain pipe there that couldn’t be removed. Sneak peak of the sink, wall, and bench below and I promise to post soon about all 3 . Subscribe here so you don’t miss it. 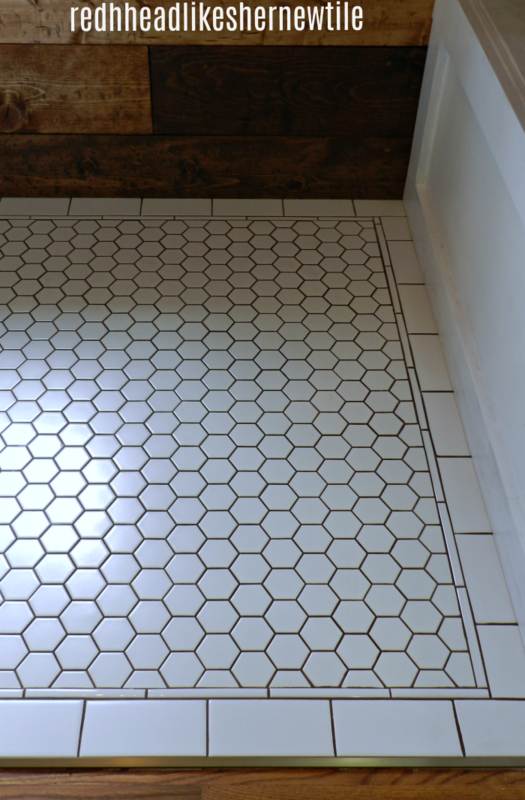 Isn’t the classic white hexagon tile just so pretty, especially up against the wood? The tile guy and I both came up with this design, and I was set on *dark brown/grey grout due to the brown in our existing Corian counter-top. I have to be honest I had a hard time choosing tile. I even tried to go to a tile expert store and wow, that place was horrible. The best advice I can give you when choosing your tile is to search on Pinterest and save the styles you like the best. When you find your tile installer, ask him what his advice is on what you saved and together you should be able to come up with a plan. *I do not recommend using dark grout. I love how ours turned out, however, it was difficult for the color to not show on the flat white tiles. The shiny tiles weren’t an issue, but the flat were. Lots of cleaning involved and more work for the tile company if you choose to go dark. After the flat tile was finished we had to scrub them with white cleaning sponges like these. So, now let’s take a peak into the shower area, although I can’t share the full shower until the shower door comes in. Whoa! What a change, right? It’s exactly what I was looking for. Vintage, classic, modern, white. Check out that gorgeous toilet, too. 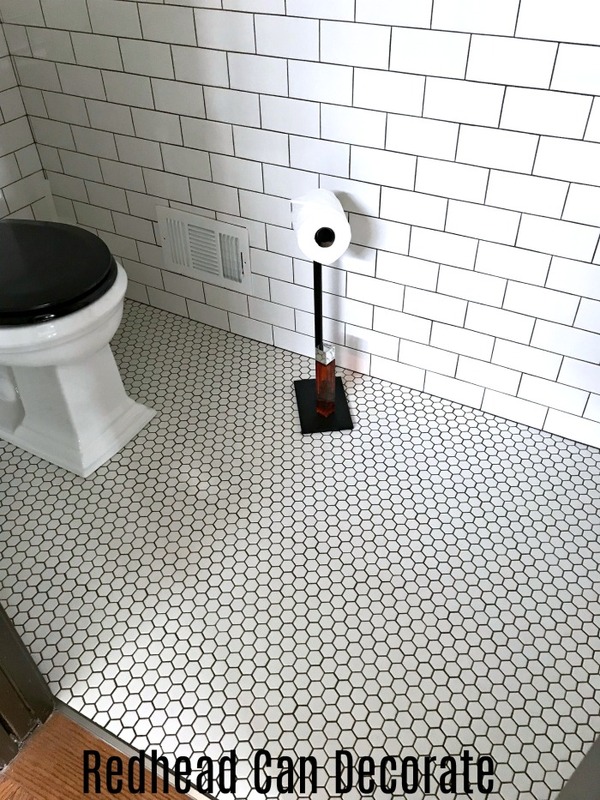 I think the gorgeous tile speaks for itself, but I want you to get to know our new toilet, too. At first I was going to pick just a plain white boring toilet and white toilet seat. Then I got to researching and realized that the toilet is way more involved than just the color. This toilet is special for 2 reasons. One, it is higher than usual toilets (comfort height is the term) and doesn’t hurt my knees or back as much as our old one. Two, this toilet is super powerful. When I push that handle to flush, WOOSH!!!! This baby takes it away in a flash. In addition, I don’t have to wait 5 minutes to flush more than once. It’s instant. We love this toilet so much, I’ve nick named it “Turbo Toilet” . I am so not joking. The toilet has changed both our lives. I actually just bought another one for our 1/2 bath (see sources below). 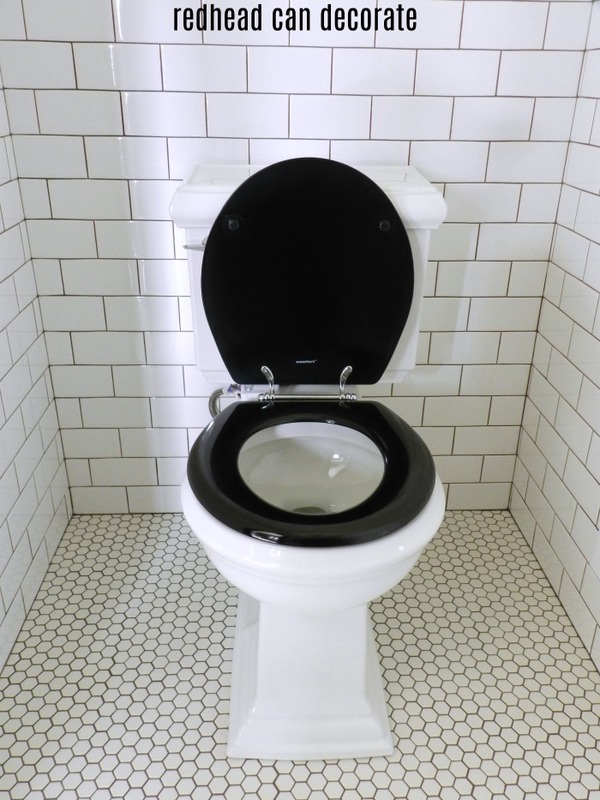 Oh wait, I’m going on and on about the turbo toilet, what about that gorgeous black seat? I am quite proud of this idea, my friends. 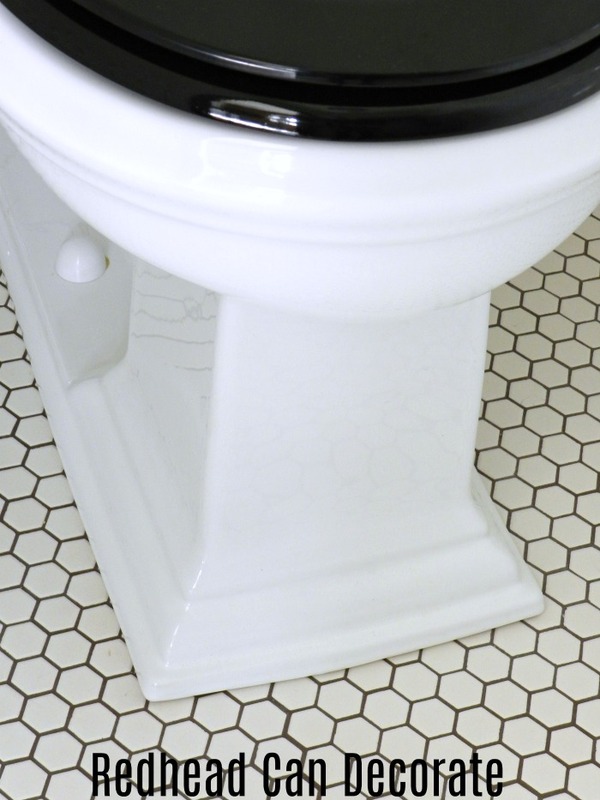 There’s nothing more classic vintage than a black toilet seat. The idea came to me one day, and when I found this wooden round black beauty, I just couldn’t resist. The two are a perfect match. Can the “can” get any better? Why yes it can 😎 . 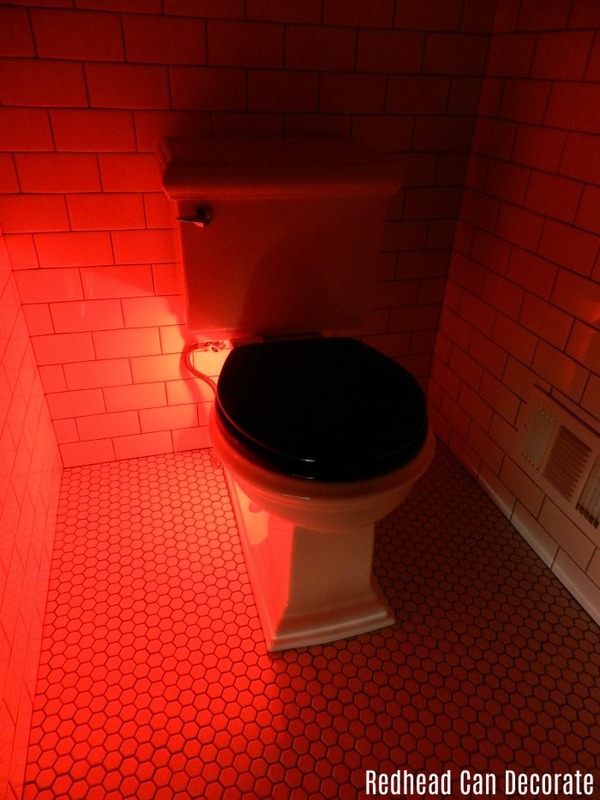 Did you know that your toilet can have a censored night-light that goes on when it’s dark as you approach the toilet? Well, now you do. I completely recommend getting one for safety and fun reasons and my source is below. FYI, I placed mine on the exterior of toilet near where the toilet seat is attached rather than the interior. I kind of feel like going to the disco now, especially since this night-light shines many colors, not just red. 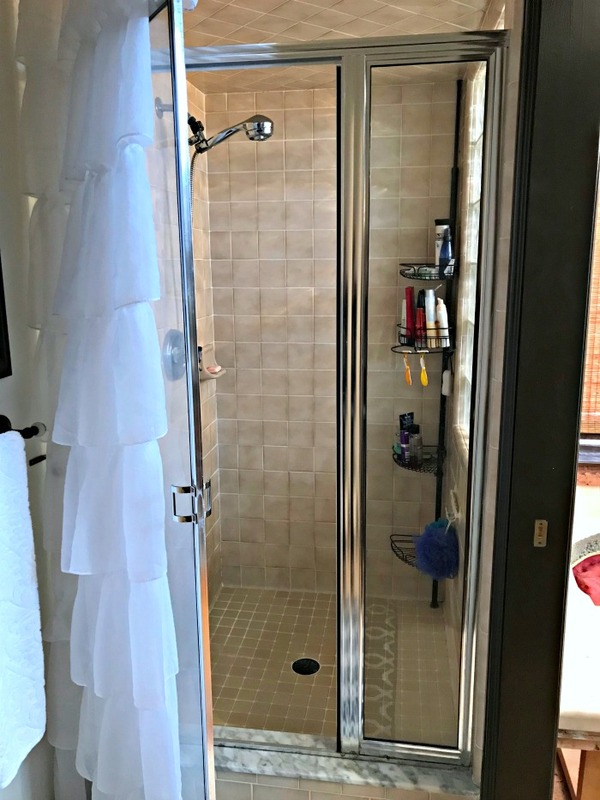 Next up, is our full shower tour including the vintage style faucet system we had installed, the new glass shower door, and an amazing tiled shelf I designed. 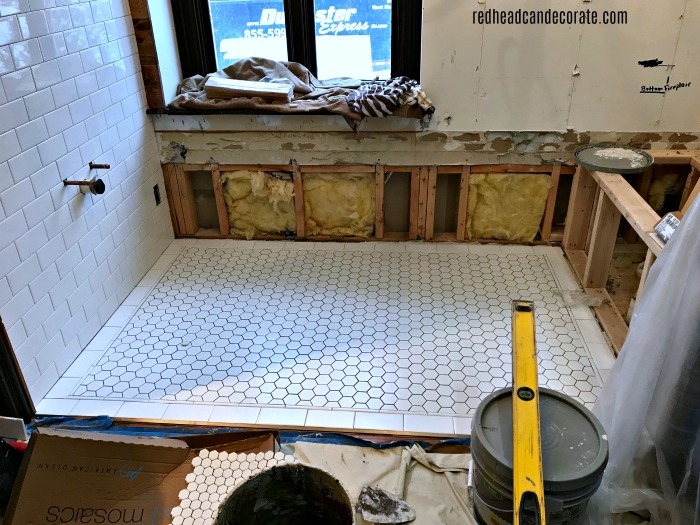 Then after that, I have several more reveals including how we managed to make our white tile not seem so sterile by adding rustic and cozy elements. 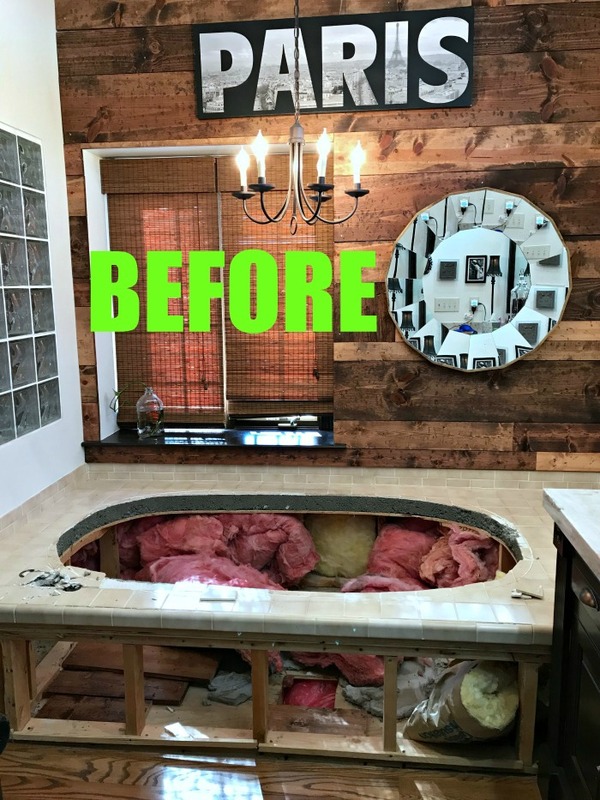 There’s a ton left to see still including my vanity makeover, my husband’s new sink, the fireplace (sh! ), the custom stained bench with a DIY button tufted back, the new mirror & light fixture, and lastly the ceiling fan, and new blinds. EEK. It is really a nice job, you did good, Julie and Rick, love to all. Dad and Mom in NY. 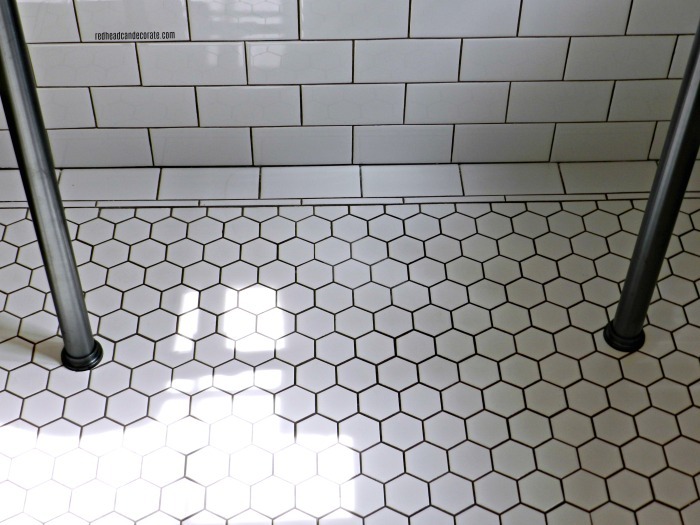 Love the classic white subway tile with dark grout. I’m thinking similar but marble. Hi Lisa! That sounds beautiful. 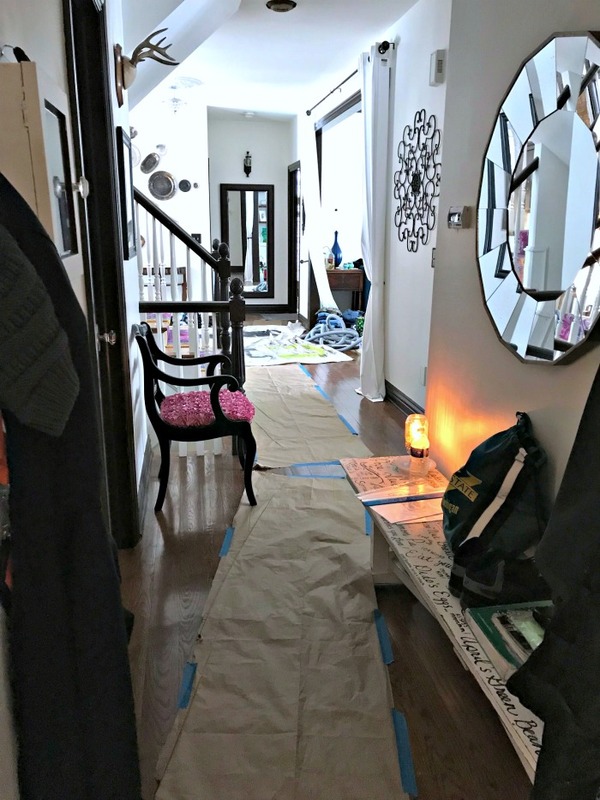 I hope you read the section in my post about why I wouldn’t do dark grout again. The marble in threshold, seat, and shelves in the shower all had to have special cleaning from the dark grout. It’s a lot harder to work with especially with pourous stone. Oh my goodness!! That must have been awful, Rebecca!! Hope it wasn’t too painful! What did you hit it on? 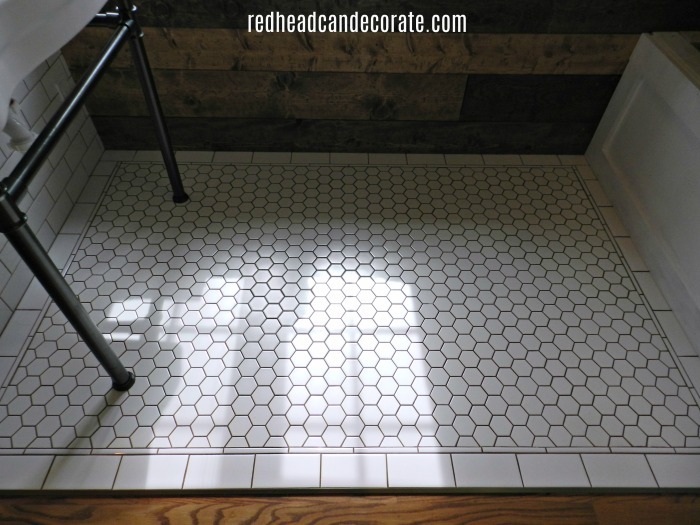 I love the pics of the tile work – it’s amazing. Good tile work is like art. That vintage tile – both floor and subway wall tile – never goes out of style. Am looking forward to seeing the entire reveal. Good job. Wow what a HUGE undertaking, but the results are striking. I love the floor border areound the hex tiles. We have original hex in one bath, with original light grout and have been tempted to darken the grout. You have given me inspiration ! Someone removed the threshold and your subway border might be the perfect solution! Yours look wonderful!!! Gorgeous; looking forward to the next posts!! You really have an ‘eye’ for what looks good. That must have been a lonngggg 5 days being all taped up! Well worth it in the end though. White subway tile has always been my favorite (still don’t have it in this house) 🙁 Great job!! It looks amazing Julie! You guys are doing great and I can’t wait to see the rest! Hurry up and reveal it!! Lol! Just kidding! In one of your before pictures, I saw a white ruffled shower curtain. I have been looking for one and can’t find it, whwere is that one from? I love all the work you do and the results, just wonderful. Hi Julie – can you please send me the name of your tile guy? I’m in Lake Orion, MI. The bathroom looks great – I need less removal of tile but would like to remodel the shower which at present has a fiberglass insert. Thanks so much! I may have to also get that nice toilet! Wow, how exciting this is getting to peek into the progress made so far! I love the look of classic black and white tile in the bathroom, fantastic!!! Great minds think alike, when we updated our bathrooms, we went with the same Kohler toilets! 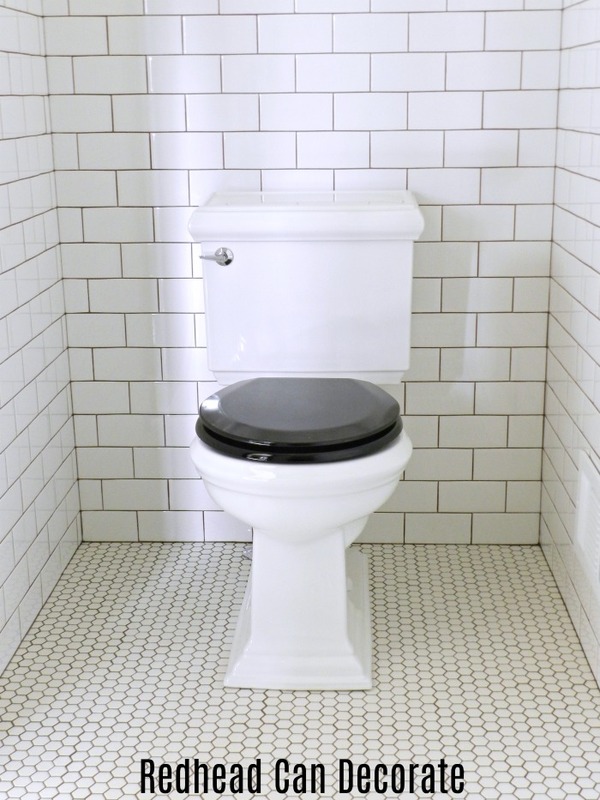 I love the comfort height, and really notice a difference when using a “low rider” toilet elsewhere! I’m looking forward to the full reveal!! Julie, I love what you have shown us, and I can hardly wait to see the entire results. I know everything will be amazing, because everything you do is always amazing. your ideas, your creativity, your designs is drop dead out of this world fabulous. Thank you so much for alwaysIvory post your amazing designs. I am still so far behind in checking my emails. was so happy that you are still sending me post, because I don’t know what I’ll do if I lost your site.